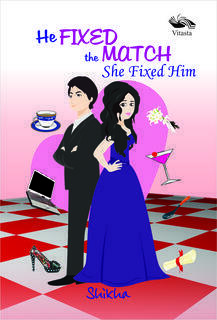 Home » author requested review , books , review » Book Review: He fixed the Match,She Fixed Him! Book Review: He fixed the Match,She Fixed Him! So,'HFTM:SFH' tells the tale of Shreya,an ambitious,highly qualified Dilli girl and Kunal, a young entrepeneur.Kunal tricks Shreya into an arranged marriage and how Shreya fights back and make the crooked Kunal fall in line is what this book is all about.As you might have figured it by now,the plot of this book is wafer thin and what makes it work to some extend is the writer's minty cool approach to her debut work.Shikha has made sure that the tale is peppered with entertaining one liners and interesting incidents though one wishes that there were more of them.A little more imaginative plot interesting plot twists might have made this book a far better work. Verdict-On the whole,'He Fixed the match...' is a passable affair. I'm giving it a 2.5 out of 5.